Kellogg’s Muesli is targeted at time-pressed, health-motivated young adults who need a breakfast that fuels their morning for their action packed day ahead. To this end, Kellogg’s Muesli is positioned as a Multigrain Breakfast for the Unstoppables, and is ruling the space of ‘unstoppable moments’ on social media. Father’s Day was the right opportunity for the brand to meaningfully engage with consumers, because fathers are an oft un-acknowledged, unstoppable force in their children’s lives. So, Kellogg’s Muesli took to celebrating Unstoppable Dads on social media by associating with a micro-fiction publisher (Terribly Tiny Tales) and an established football celebrity (Sunil Chhetri). The brand realized that storytelling is a medium that can touch people’s hearts, and when it comes to fathers, people have endless stories. The brand collaborated with Terribly Tiny Tales (TTT), a community of 1.1 million followers on Facebook and 8.4 lac followers on Instagram. 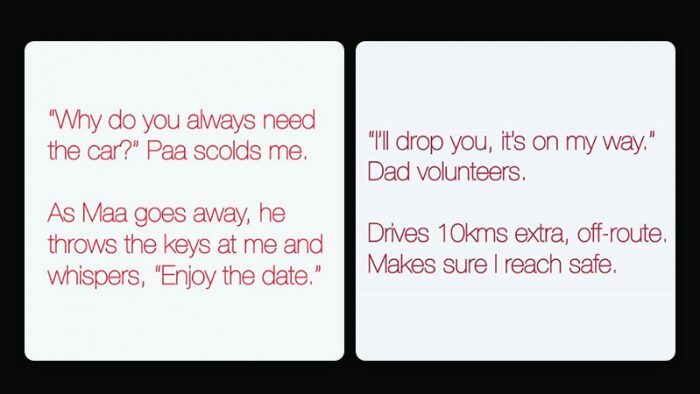 When TTT came together with Kellogg’s Muesli, the outcome was several user generated short-stories about #UnstoppableDads that were published by TTT on their social media pages for seven days, in the lead-up to Father’s day. The sheer scale of engagement generated by these stories of #UnstoppableDads was exhilarating. Finally, on Sunday, Kellogg’s Muesli collaborated with Sunil Chhetri to publish a video, talking about his unstoppable dad and wishing everyone a happy Father’s Day. Given the current football fever and his unstoppable attitude, Sunil Chhetri proved to be a perfect fit for the brand. The element of relatability was high and that helped achieve scale. The entire campaign created over 81 million impressions and garnered over 6.4 lac engagements across Facebook, Twitter and Instagram in a week. On Sunday, #UnstoppableDads was trending #2, after Sunil Chhetri posted his #UnstoppableDads video. Sunil’s story inspired a lot of people to engage with the hashtag and tweet their own personal stories. Brands like PVR India, MI and Honda, among others used the #UnstoppableDads hashtag on Twitter on Father’s Day. Also Read: Cannes Case Study: How Skittles made a California teen the ultimate brand influencer!